Summer has arrived and many of you will soon be jetting away to beautiful locations around the world. Some people are lucky enough not to have to go far for fabulous views though, or even leave their garden…just like Omlet customer Angela. 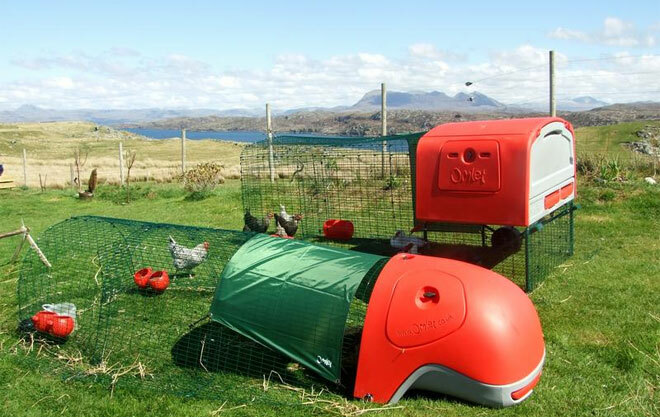 This photo of her Eglu Classic and Cube, in Lochinver, made us all a little henvious, and we think it could be the best view from a chicken house that we’ve ever ‘laid’ eyes on. Think you can beat it? Send us a photo and we’ll share our favourites in the next newsletter. Brilliant news for our fans in the USA – the Egg Ramp is now available for you to buy! In four great colours, the Egg Ramp is the latest storage solution for the eggs from your backyard chickens. Not only does it look stylish, but it keeps your eggs in date order, so you always know which one to eat first. Every time your hen lays an egg, simply add it to the Ramp, and use the one at the front first. 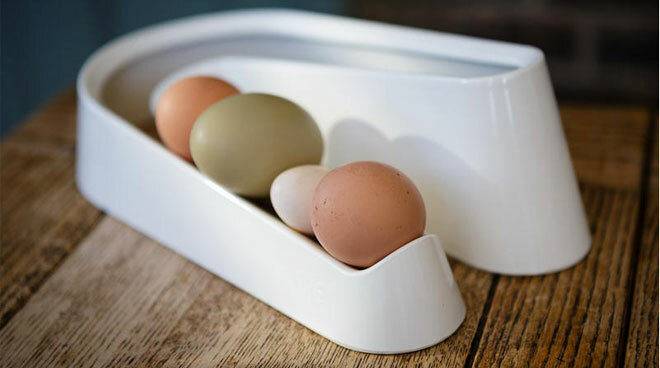 The Egg Ramp holds a dozen medium eggs, but it takes up little space on your worktop. You can use it for bantam eggs too. Made from shiny melamine, this is a kitchen eggcessory that looks sleek and wipes clean easily. The only question is, which colour will you choose? Buy today for just $23.99! Rumour has it there’s a new super hero about – Alonzo the Chicken. Haven’t heard of him? That will soon change. Alonzo is the star character of a new series of books by Debbie Kelly, ‘The Adventures of Alonzo the Chicken’. 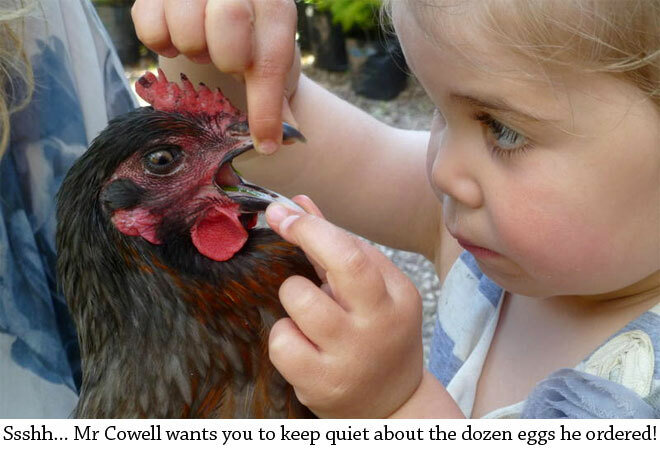 This is set to be an eggciting collection of stories, suitable for 5-8 year olds. 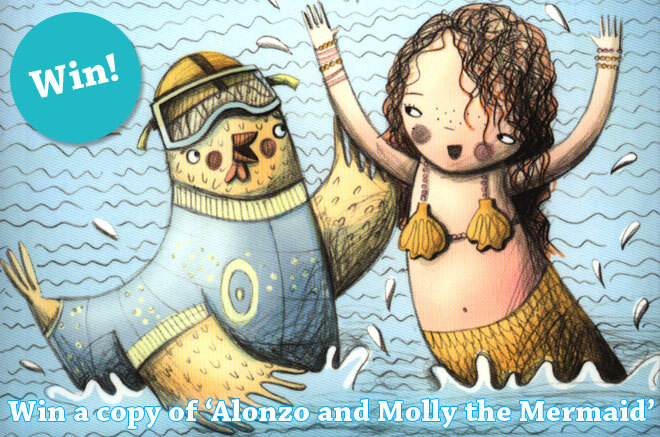 The first book in the series, ‘Alonzo and Molly the Mermaid‘, is an imaginative, maritime adventure for early readers. When Molly the Mermaid is kidnapped by pesky pirates, Alonzo and his friends swim in to save the day. It’s a brilliant story, with fab illustrations, and we have three copies to give away. For your chance to win a copy, email your name and address to stephanie@omlet.co.uk, using ‘Alonzo Competition’ as the subject line. Send your entries by midnight Sunday 7th July. Good cluck! 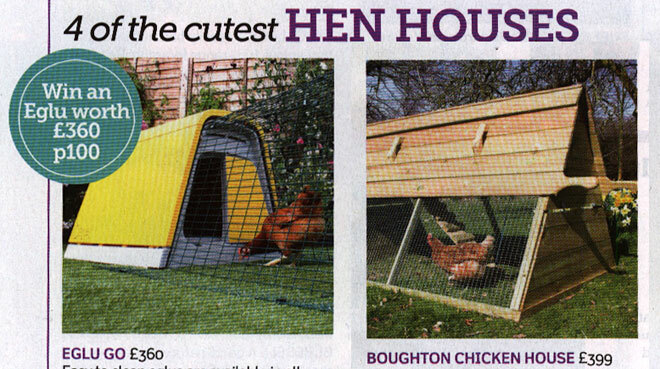 The latest edition of Garden Answers magazine has featured two Omlet products in its top four cute hen houses. Not a bad result we reckon! 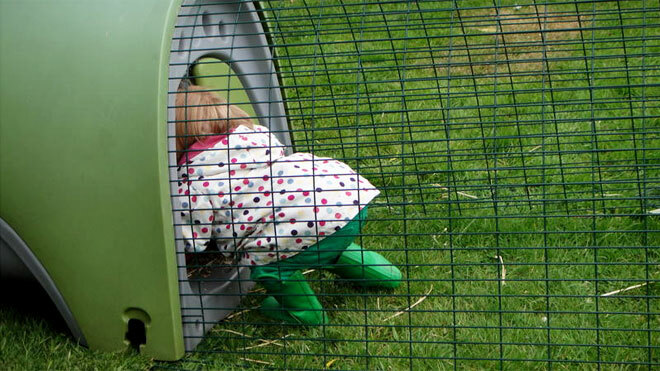 They like the Eglu Go for its ease of cleaning and fox-resistant run, while the Boughton Chicken House is a ‘neat little house’ with a run underneath. Our range of chicken houses cater for every taste, so whether you like things modern or traditional, you’ll find a chicken coop to suit you. There’s a brilliant article on keeping hens in the magazine too, with advice on breeds, feeding and costs. You can pick up your copy today to read all about it, and make sure you turn to pg 100 for a chance to win an Eglu Go too! Are Chickens more Clever than Toddlers? Christine claims that chickens can distinguish numbers up to five and they understand transitive interference (the idea that if A is greater than B, and B is greater than C, A is greater than C). They can also exhibit self-control – one eggsperiment showed that 93% of hens understood that waiting longer to start eating their food would allow them to access it for longer. And, the physics? Unlike human babies, young chicks know that an object that moves out of sight still exists. All in all, chickens are far more clever than they’re cracked up to be! 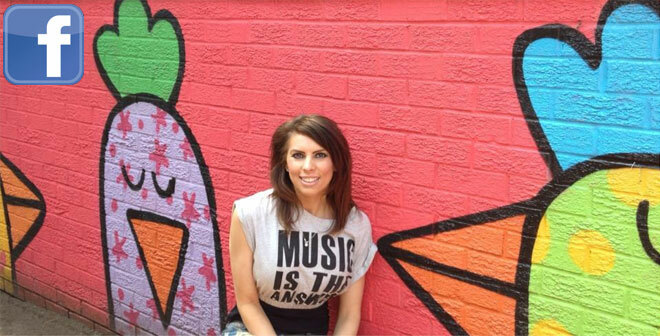 We’re not one to condone graffiti either, but we do think this is rather impressive! Keep an eye on our Facebook and Twitter pages for more caption competitions! 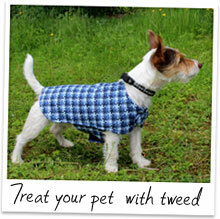 Dog Jackets – These gorgeous Dog Jackets have been handmade in Scotland, by Perdie & Boo. Available in two sizes, and with two designs to choose from, your pet will look dapper in these hand-washable tweed coats. From £25, with Blue and Brown Tweed options available! 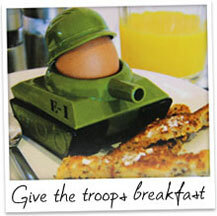 Egg-Splode Egg Cup Set – Is breakfast more of a war scene than a civilised sit down in your household? Then this set is an appropriate choice for getting the troops in position every day. Complete with soldier shaped toast cutter. Buy today for just £6.49! 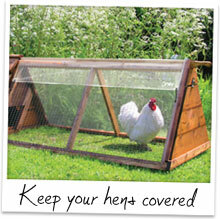 Covers for any Chicken Run – Our best-selling Clear and Heavy Duty Covers are now in a new size, ideal for any chicken run, to keep your hens dry. Measure 1.5m x 0.9m, complete with bungees for attaching to the run. £24 each, in Clear or Heavy Duty!